hi, happyliving, it is great to hear you are recovering well. hopefully you can show us some pic? mbk wrote: I have been there once and going there again to see the doc. Maybe Monday. Yeah, the hotel brand new. Small but very nice from outside. It is right next door to clinic. have you visited yoskarn? who is the doctor? doc somyos kunachak? how was the consultation? have u decided who to do ur ps with? do u hav any ps experience with yoskarn? IS THE ANYONE WHO EVER HAVE PS EXPERIENCE WITH DR SOMYOS KUNACHAK AT YOSKARN? Happy for you that you have a new nose which you finally like. However, guess happyliving is not as lucky as you. I did contact her early this week.. seems like she had not a very nice experience during the op. Just hope that she will recover well and will get what she expects from her nose. I'm OK, don't worry... Dr Nara is good. Thanks for your kind recommendation. Just need sometime to get used to my new nose. All the best on your coming PS trip. my mouth was being operated on, so i couldn't talk, so i started moaning... hahaha... kept moaning and moaning until dr nara scolded "you pain or you scared!" just remember to moan if u ever wake up! quite scary to be awake during PS, luckily din feel any pain rite. i cant imagine if the dr is working on the eyes and the patient awake..
I’m a ps newbie. I read from the previous posts that you’re planning to have your surgery done by Dr Nana in May 2008. Have you found anyone to go with you? 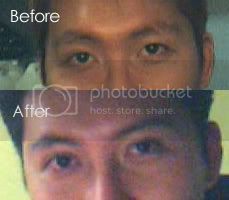 Actually I'm planning to do my double eye-lid.. do u have any before and after pic of Dr Nara work on double-eyelid surgery? Do you mind sharing? If you're comfortable with it, can you please add me on the msn? 10x! 10x for posting up those pictures & addin me in the msn! You look great! How many days did you stay in hatyai when you did your double-lid, chin & rhino( back in 06) ? How many days did Dr Nara took to perform all 3 parts? I am thinkin of doing double-eyelid, alar & rhino at one go.. Do you have a rough idea on how many days he would take? simplegal84 wrote: quite scary to be awake during PS, luckily din feel any pain rite. princessli wrote: Wish you all the best aadvark..
takuda wrote: wish those going with aadvark a succesful trip to hatyai ahead! Thanks for your mail and interest in our clinic. improve the tip simultaneous except you have very big nose tip. garment, post op care and follow up. and medical history, allergies and whether you drink or smoke etc. including photos of the face in 3 views? I appreciate your assistance in providing the requested information. sounds appealing, the price! for tip refinement, i wonder do they really refer to the tip rhinoplasty? oh and the proce for implant and alarplasty is so much more ex than nara! can anyone advise or comment on the 12 hour bus trip to Hatyai Dr Nana...? Wonder whether could it be a workable choice...? Is DR NARA ( male ), not NANA...lolz . . is workable, a few of them did it. and i am e next one.